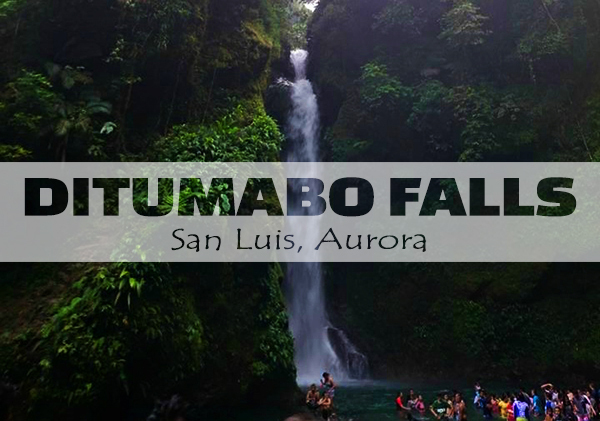 Aurora province was blessed with a number of picture-perfect waterfalls and almost every town of the province has its share of this blessing. 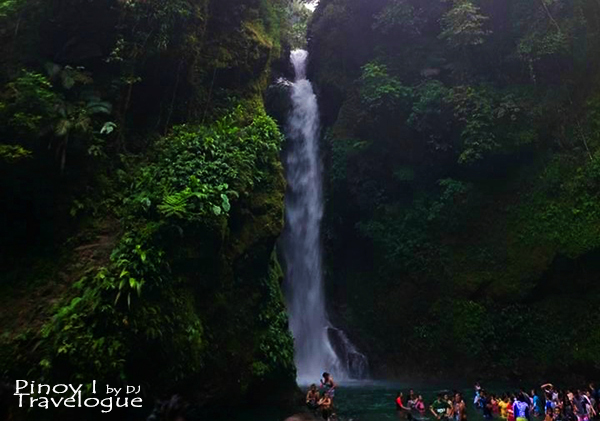 But the tallest and grandest "known" waterfalls in the province, aptly coined as the Mother Falls for having such distinction, can be found in the town of San Luis. 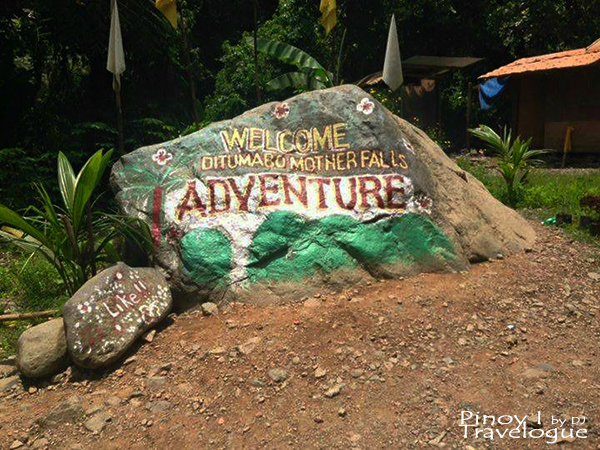 Ditumabo waterfalls, more commonly referred to as Mother Falls, is nestled within the lush forests of Barangay Ditumabo in San Luis. It is said to be 140 feet high with continuous gushes, cascading its waters into a 30-meter wide catch basin. 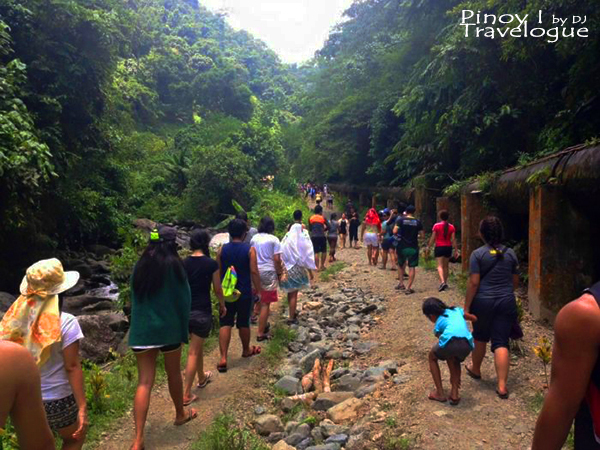 A trek to Mother falls is usually a part of every Baler getaway because of the falls' proximity to the town. 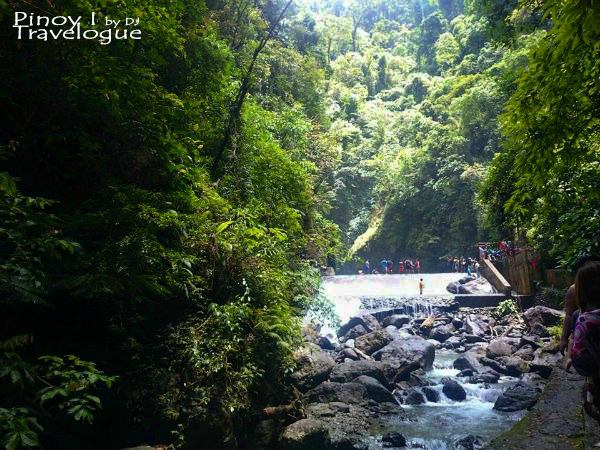 Chasing this scenic waterfall is a top thing to do when visiting Baler, alongside surfing with its Pacific waves to appreciate Aurora's charm. 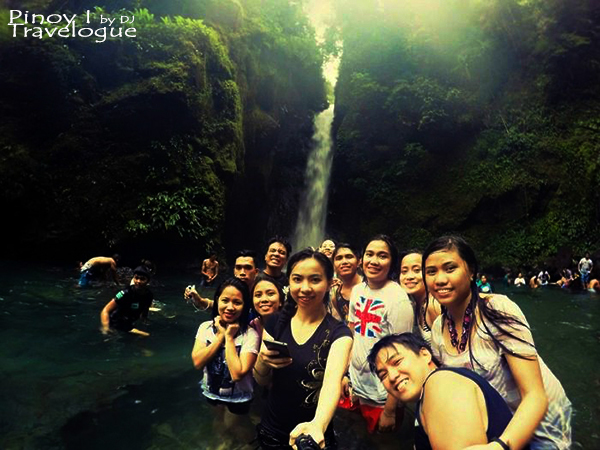 Chasing Mother Falls required an ample chunk of our Baler itinerary. 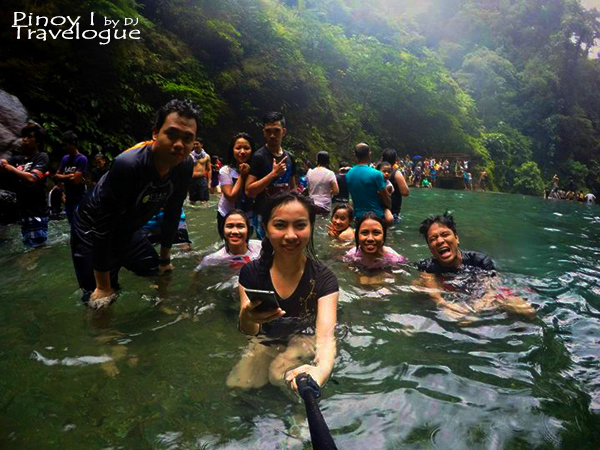 We took a 20-minute drive from Baler proper to Barangay Ditumabo, a 3-kilometer uphill trek toward the falls, less than an hour of wading on its natural pool, accumulated minutes of several photo stops, another 1.3-kilometer trek downhill, and about 20 minutes of bumpy and shaky tricycle ride back to our set-off point. 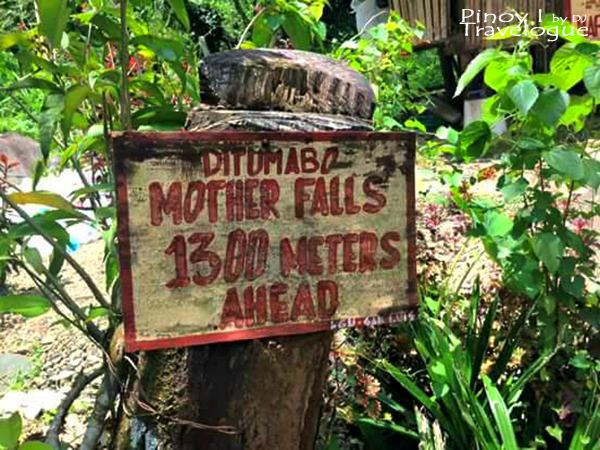 Trekking to Ditumabo Falls is not a walk in the park. 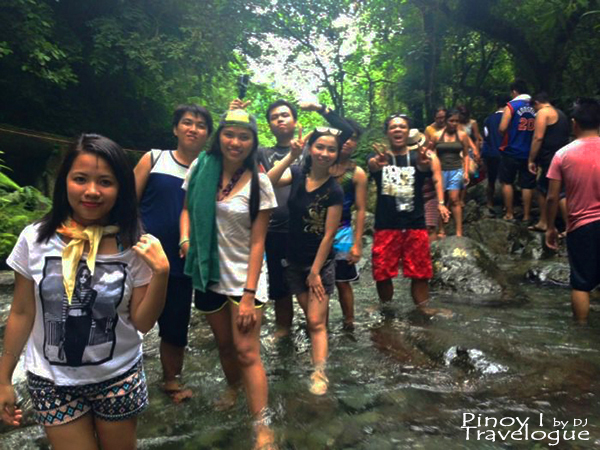 It involves river crossing and boulder hopping, and the trail is generally rocky and slippery. It would not be called an "adventure" for nothing. Nevertheless, the climb is cool as lush trees provide trees most of the time. 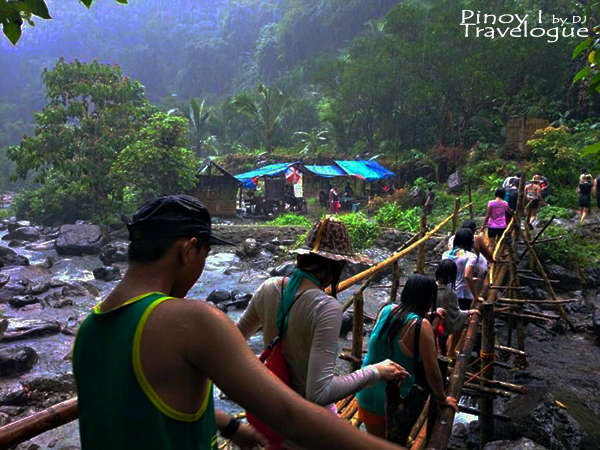 We parked our van in the area which is about 3 kilometers away from the falls where a tricycle terminal was located. Tricycles take tourists to the 1.3-kilometer mark where the trekking would commence. Any type of vehicle could not pass beyond this mark. Tricycles were within our reach, but thinking at first that it would take us straight to the falls without us posing for a picture with every panoramic view that we would be passing by made us decide to walk that 3-kilometer path toward the falls even while the sun was at its peak. However, we saw only lush mountains along the way. Greater scenery are marveled at the trekking set-off point onward. Upon reaching the 1.3-kilometer mark, we registered our names at the tourism booth near the town's hydroelectric power plant and paid a minimal amount for environmental fee. Past the plant are big pipelines that can be used as guide as it leads to the falls. As we trek along a concrete trail, we were greeted by a smaller waterfall a couple of meters away from the actual Mother Falls. We playfully called it as the "Falls Alarm" as we thought we already reached the real Mother Falls. 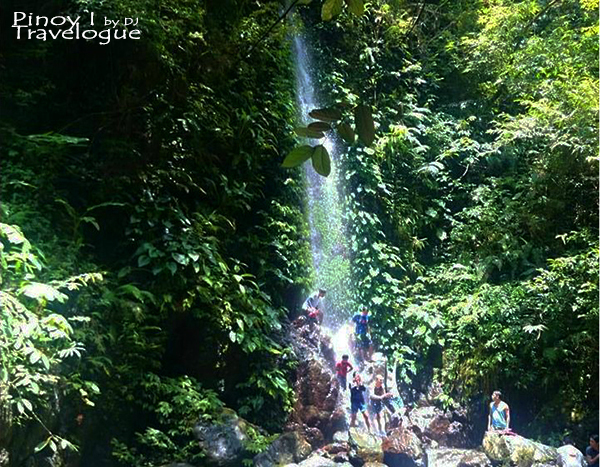 Most trekkers skip this first waterfalls and head straight to the more spectacular Mother Falls. Seeing a small dam from afar indicates that the Mother Falls was just right around the corner. The dam encloses the falls' catch basin creating a pool where trekkers can take a dip. 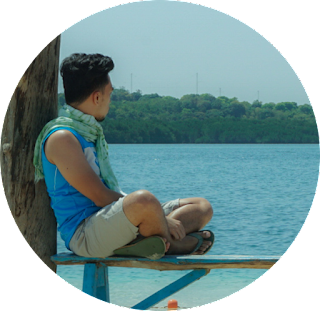 However, the platform beside the dam that serves as the entrance to the pool was bursting with visitors that day so we waited for a couple of minutes before we finally enjoy its waters. The water is freezing cold! I almost felt numb down my crotch and my soles got cramps a couple of times because the floor was damn rocky. There were submerged boulders where you can sit on to take a break from swimming and warm your body. Walls covering the falls from sight during trekking are filled with different sorts of plants and some stones on the floor were covered with slippery moss. Most parts of the falls' catch basin are shallow making it easy and safe for non-swimmers. Some parts, however, are several feet deep such as the area beside the dam and the area where the falls cascade its waters. Trekking a couple of kilometers up and down the hill was energy-draining so we fueled up ourselves with food and refreshments being sold at the stalls along the trail before we finally headed back to the area where we parked. 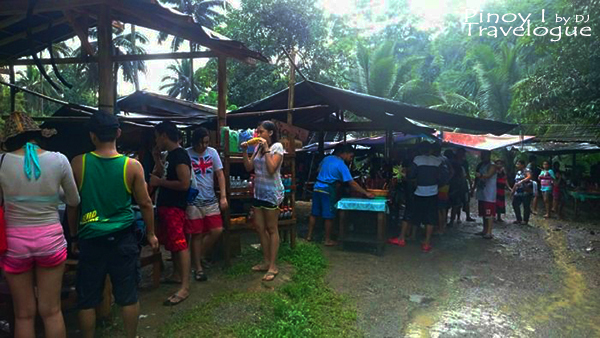 Local traders also sell souvenir items on these stalls. 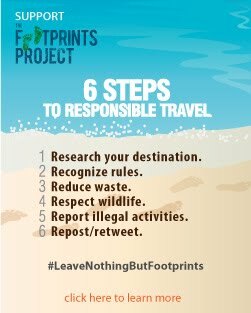 Take care while trekking. The rocks you need to step on were slippery especially after it rained. Iwan ang katangahan sa bahay or sa sasakyan. LOL! Take extra care of your belongings. Better have a broken head than a broken camera. Right? Hehehe. Quench your thirst through a free potable water coming from a hose located somewhere along the way. Was it safe to drink from it? Well, I was able to come home and write this entry. Prepare your balls for the bumpy and shaky tricycle ride. 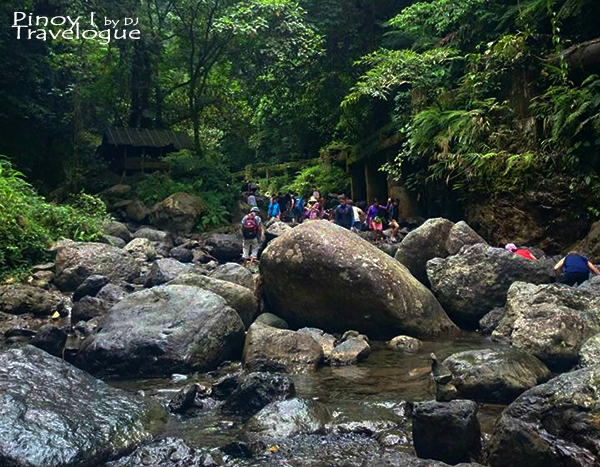 It would be a rewarding experience to check out this majestic natural attraction of San Luis when on a trip to Baler. Stretching those hamstrings out, trekking, and having a quick dip at its freezing cold pool was indeed an antidote for the sweltering tropical climate.